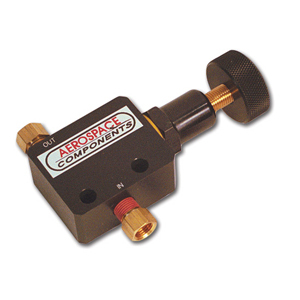 Compact and lightweight billet aluminum construction has made AEROSPACE COMPONENTS Proportioning Valves the best available. Pressure adjustments provide for a maximum decrease of 57% in line pressure, the most of any valve. This adjustment lets you fine tune the front to rear braking balance by proportionately decreasing the rear (or in some cases, the front) brake line pressure. Can also be used to adjust individual front wheel braking in dirt track applications. Valves weigh only 8 ounces, are anodized finished, and have two .25” side mounting holes 1.00” apart. Standard in and out ports are 1/8 - 27 NPT.